It's true, there's a LOT of different ways to generate leads. Ironically, there's just a handful of ways to follow-up with leads in your specific industry. Next step is to help you sort through the list to determine which items are worth allocating budget to test based on three things: (1) logic (2) what's worked and not worked for you in the past and (3) where your competitors are currently selling-marketing-advertising. "Outstanding Giant Killer! Much appreciated consultation. 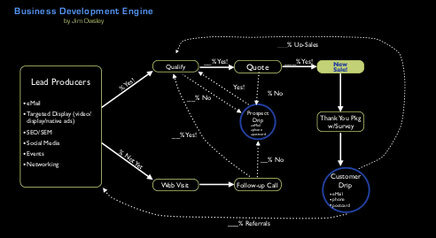 Having the sales process on a flow chart has been excellent fo all involved. Also, the post cards your team created for the Prospect Drip System are most impressive." This is a super important list because these tools are where you thoroughly educate your prospective customers/clients on what makes your product or service any different or any better than competing choices. We call them "Consultative Selling Tools" because when produced in a consumer-report style, it keeps your audience engaged; meanwhile, you're still selling without sounding "salesy". "Hands down one of the most unique recruiting pieces we've ever had produced in the history of the organization. Finally, we're actually telling the full story on what makes us better. Well done guys." This is a passion of ours that's grown in recent years. As we've helped our Clients generate new business with all those services listed above, stress can creep in as staff work hard to fulfill on that new business. So we developed "Killer Communication" as a 3-step guide to help teams get along and WIN together in the day-to-day grind. 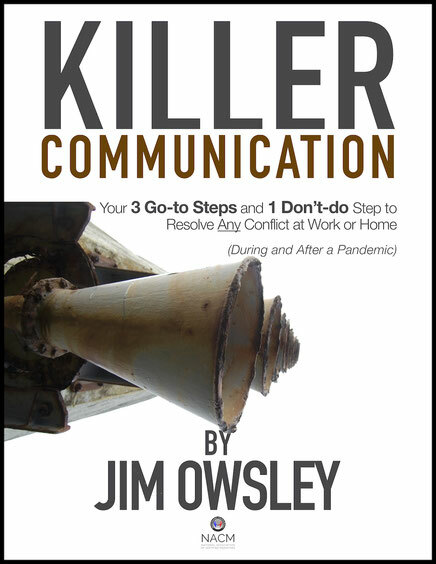 "After Jim facilitated the Killer Communication workshop for our staff of 35 we have yet to see a single personnel issue escalated to management. Jim did excellent work empowering our staff to deal direct with each other and to work out solutions that are meaningful to their respective department. I've been in the business world for over 15 years and I'd never come across an Agency that both drives business, and, helps create a positive workplace to service that business. Appreciate you more than you know Giant Killer... thank you!"